My partner and I had a week off this month and were looking for somewhere to go on vacation. 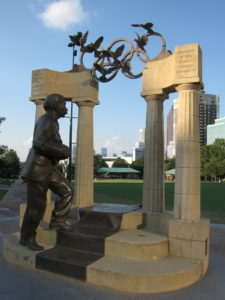 My partner suggested Atlanta, Georgia for a couple reasons. First they have good public transportation (neither of us like to drive when on vacation), secondly it was more in the path of the eclipse than Connecticut, and finally there were direct flights from Hartford. I was on board and off to Atlanta we went. 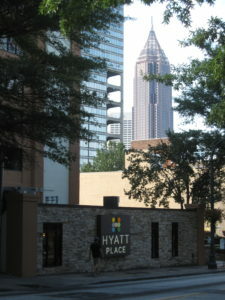 We stayed at Hyatt Place (330 Peachtree St NE) which, at times, got confusing since there’s like 4 Hyatt’s within a mile of each other and every street seemed to be named Peachtree. The hotel was nice and the room was huge but the bathroom, which consisted of a shower and toilet, was the size of a closet. It was so tight that the sink was placed in the bedroom. The biggest perk of the hotel, besides the continental breakfast, (did someone say free food) was the free shuttle that ran from 8AM to 10PM. It would take you and pick you up from anywhere within a 3 mile radius. With it’s central location, we took it everywhere. The drivers were helpful and the passengers were entertaining. One day we got into the shuttle with two women who were going to a hair convention that was in town. They were in their 20s, primping their dos and asking the driver about hot spots to eat. They asked “What are some famous restaurants around here?” and the driver said “We have a Hard Rock Cafe and Hooters”. One of the women screamed out “HOOTERS! HOOTERS! I ain’t going to no Hooters!” Later she confessed to her friend that she had been to Hooters once but the wings weren’t that great. When we weren’t shuttled around we either Ubered (which we used for the first time and loved) or we walked. Walking around new cities is the best way to get to know a place. It’s no surprise we did 4-5 miles a day exploring different parks and neighborhoods. 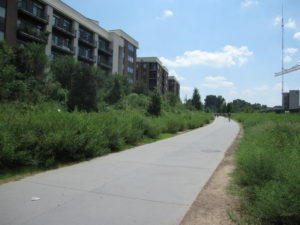 The Beltline is 22 miles of trails for getting around the city. 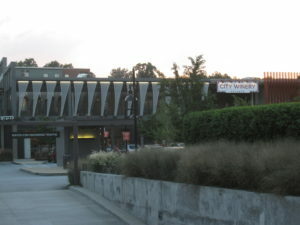 We took it to different neighborhoods like Five Points with its hippie vibe and Buckhead with it’s ritzy mansions. 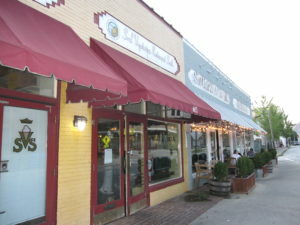 While in Buckhead we ate at my favorite restaurant on the trip called Sunflower Cafe (2140 Peachtree Rd…not the Peachtree St our hotel was on). The food was amazing but pricey but that’s Buckhead. For dessert (the most important part of any meal) I wanted cake and my partner wanted gelato. We asked them to split the cake and gelato on two plates. They said they would do it for the cake but the gelato would come in a dish. Well the slice of cake was normal size but the gelato was one melon ball size scoop that was dwarfed by the strawberry that sat upon it. My partner is lucky I love him because that wasn’t a fair split. Another amazing find was Go Vinda Cafe (1146 A Euclid Ave NE). A hole in the wall with a goth chick at the counter and 80’s new wave music playing in the background. Our kind of place with incredible sandwiches and a huge chunk of coconut cake that was too much for my partner and I to conquer. We were impressed with how many great vegan restaurants were around the city. 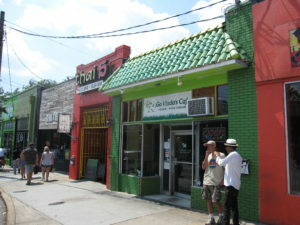 The last great place we ate at was Soul Vegetarian Restaurant South (652 North Highland Ave NE). Even though we waited over an hour to get our food, there was no air conditioning, the waitstaff never checked on us, and they ran out of something my partner ordered and didn’t tell us until our food was ready; we would still go back because the food we did get was amazing. Plus I never got the coffee shake I was craving because we were now running late for a concert. My favorite thing to do is go to concerts. When I knew we were going to Atlanta the first thing I did was see who would be in the area and what venues were around. 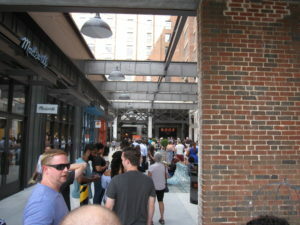 My partner was looking up eclipse information (who knew that was a thing) when he came across The City Winery. 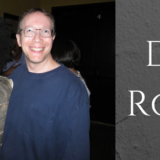 A female singer named Doria Roberts was performing. I’d only fly a million miles (or however many it is, please don’t ask me find Georgia on a map) for a diva. We’d never heard of her so he pulled up some song snippets on his phone (I didn’t have my phone and wouldn’t know how to do that even if I did). We were near City Winery early so we checked availability and scored great seats. 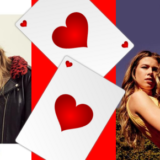 I thought she would be decent but never did I think I would be completely blown away by her show. 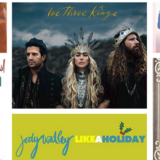 Her lyrics and instrumental talent reminds me of Lisa Loeb and Sophie B Hawkins but in her own style. After the show she came out to sign autographs and give everyone cupcakes. For once I passed up free food because I didn’t want chocolate finger prints on the merch. She’s lucky I didn’t have my partner Purell her down before she signed my download card. When on vacation, we like to hit some of the touristy places as well. 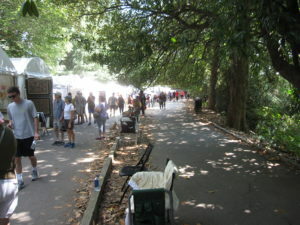 One was Piedmont Park. The weekend we were there they were having an Arts Festival with a farmers market and local artists selling their wares in tents along the park’s walkway. We spent some time meandering our way through all the food and art. 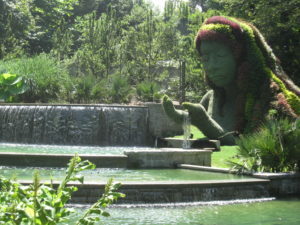 Attached to Piedmont Park is the Atlanta Botanical Garden. We’re not really plant people. 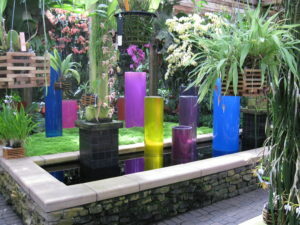 We debated if we’d really find enough to keep us engaged to be worth the $23.00 admission fee. With 30 acres of land and multiple buildings, we were able to spend over 2 hours walking through the forest canopy walk, the garden paths and the indoor botanical gardens. Definitely worth our time and money. 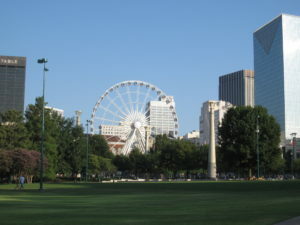 Another park we checked out was the Centennial Olympic Park that came into being when Atlanta hosted the 1996 Summer Olympics. I’m not an Olympics fan but it was beautiful with great views of Atlanta and quite a few fountains and statues. Since we did something I wanted and thetourist attractions, it was time for my partner to do what he wanted, witness an eclipse. I was prepared. He had me watch eclipse videos (during which I rolled my eyes so far in the back of my head that I almost blacked out) and had it explained to me in depth. Please don’t ask me to explain it, I’d have a better shot of finding Georgia on a map. 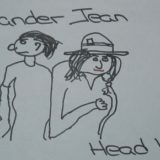 I may have been scientifically prepared but we weren’t physically prepared, we didn’t have glasses. But we had a plan. 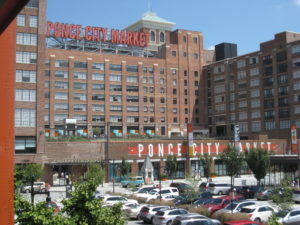 On top of the Ponce City Market (675 Ponce de Leon Ave NE), a converted Sears & Roebuck building, is a carnivalesque Skyline Park and they were hosting an eclipse event. For a $10.00 admission the first 250 people would get free glasses and be able to enjoy the view of Atlanta plus see the eclipse. How many people would pay $10.00 to go on a roof to watch an eclipse? More than they had glasses for, as we found out when we approached the front of the line and they ran out. The eclipse was still going to happen whether or not we were ready though. 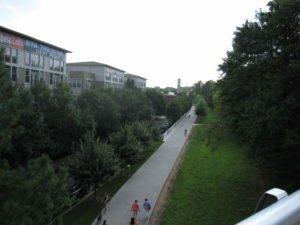 The Beltline ran through the Market so we decided to find a place to sit there. 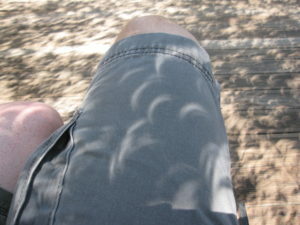 My partner explained that we could see the eclipse on the ground through leaves on a tree so that’s what we did. I didn’t believe him and I don’t know if he was more excited to see the eclipse or to be able to prove this theory to me and be able to say “I told you so.” I think the later. 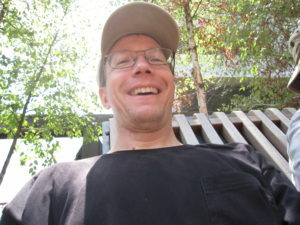 I took selfies with the sun (my chins eclipsed it) as my partner rolled his eyes knowing the eclipse wouldn’t show. People mockingly sat around us wearing their glasses. 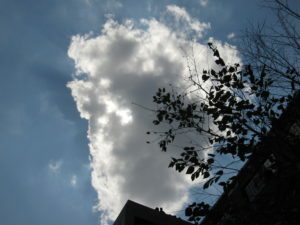 As it got closer to the peak time a cloud moved in blocking the sun. The moan from the crowd was deafening. People without glasses started looking up saying how cool it looked. I knew better, but I still looked up, risking blindness. Of all the ways I’ve risked blindness over the years, never did I think it would be from looking at an eclipse. Over all, Atlanta is by far the most polite and courteous place ever, at least in my gay opinion. For a city it’s pretty quiet. It’s rare for a car to honk or an emergency siren to ring out. 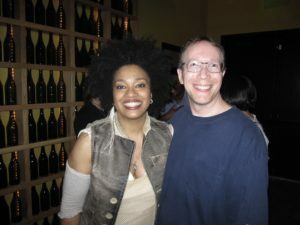 My favorite thing about Atlanta were the ladies, they had a sense of style and fun-loving attitude that couldn’t be beat. Where else could I see a lady in gray skin-tight sweat pants accentuating them with a bustier covered by a purple see-through plastic shirt? 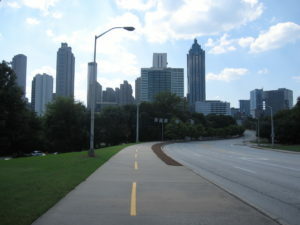 Atlanta, that’s where, and I loved it.